We live in a world where a third of the food we produce is wasted, while over a billion people go hungry. Where half our greenhouse gas emissions are caused by an industrialised food system that is also at the root cause of many of our health problems. We are told – by corporations and lobbyists – that we need better, high tech solutions to feed a growing global population when we have the solutions right here, right now. The problem is very few people are aware of this – or of how it directly effects them now and in the future. The truth is that over 70% percent of the world’s population is already fed by small, family farmers using traditional, regenerative and sustainable methods of agricultural methods that work with nature – not against it. This system of agriculture is called ‘agroecology’ and it is championed by the UN and by every aid organization and environmental group in the world today. It is the only way to sustain a healthy planet and a healthy population for generations to come. 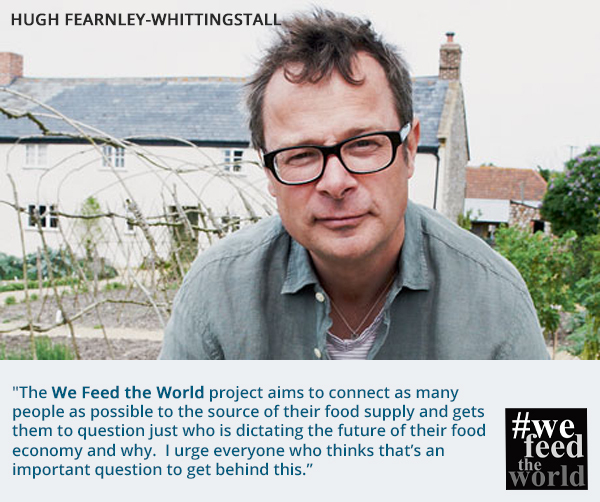 We Feed the World is an international campaign which aims to engage a large, mainstream audience in the debate about the future our food supply. We want to show – through image and story – how we are all connected to the food system through the choices we make every day about where we shop and what we eat. The importance of this message has attracted some of the biggest names in the world of photography. They have agreed to give their time to take portraits of farmers around the world who are successfully providing food for their families, communities and for us using agroecological farming. These powerful images and their accompanying stories will form a large-scale exhibition, which will open in London in September 2016 and then tour six regional cities in the UK including Bristol, Glasgow and Liverpool. The public nature of the exhibition, plus the accompanying media, will attract significant attention to this vital story and ensure many more enter the debate. Money raised through our this page and through other sources such as our Crowdfunder appeal and other sources will enable this to happen. Then it will go onto help finance small, farming projects around the world through the sales of the exhibition prints and the accompanying book and further dissemination of the project. The farmers will be selected from hundreds of real life case studies from around the world. Together, they will form an global picture of agroecology in action, representing a wide cross section of age, gender, backgrounds and agricultural practice. Their stories will introduce us to the challenges facing agriculture today as well as the farmers’ personal experiences of producing food for their families, communities and the wider market. We have been lucky enough to meet some of these farmers already and there stories are truly inspiring. From small villages in India where the women call the shots to the man who turned a disused, inner-city parking lot into an urban Garden of Eden, these are stories of individuals, families and communities who have overcome the odds or defied the status quo to produce food in a way that works for their health and environment as well as their financial future. 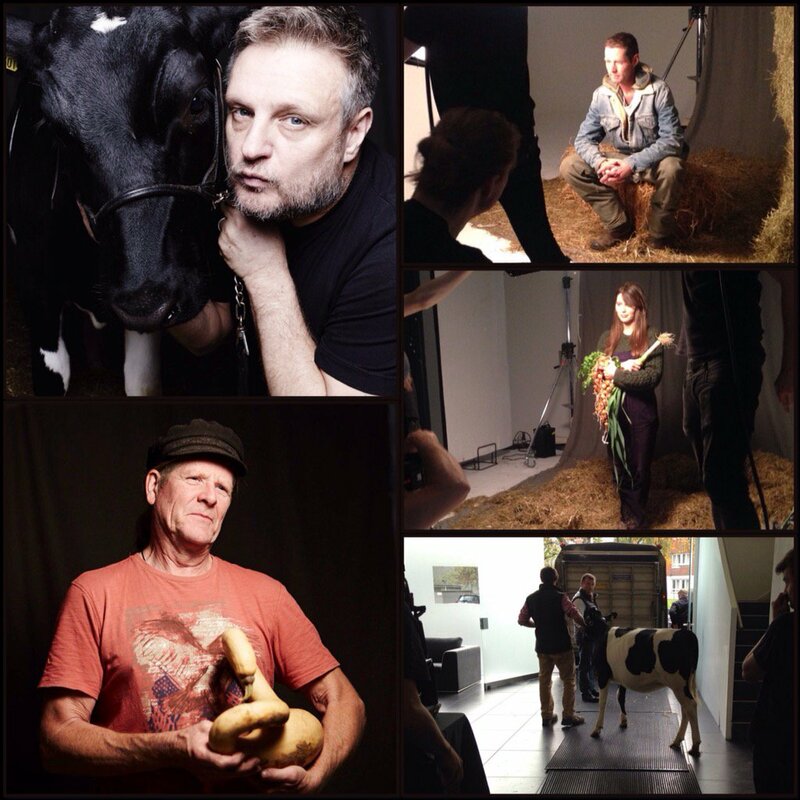 Photographer, Rankin, with some of the farmers he has photographed. Clockwise from top left Rankin with Kylie the calf from Yeo Valley, Ed Hamer of Chagfood, Alice Holden of Growing Communities, Kylie the Cow arriving at the studio, and Ian Tolhurst of Tolhurst Organic. We are working with ex-picture editor of the Daily Telegraph Magazine, Cheryl Newman, to bring together a body of world-renowned photographers who will donate their time to take portraits of farmers around the world. These include fashion photographer, Rankin, award winning British photographers Marcus Bleasdale, Magnum photographers, Alec Soth, Jim Goldberg and Alessandra Sanguinetti and celebrated Brazilian photojournalist, Sebastiao Selgado plus many more. Each of the photographers will take portraits of farmers in a country they are familiar with – either where they were born, live or work. The exhibition will be made up of some 100 images of farmers and their environment. It will open with a high-profile launch party at a central London venue late in 2016 for a run of two weeks. From here, it will tour six regional cities around the UK. At each venue, Beyond GM will work with local food groups to engage the community in the issues the exhibition highlights through a series of talks and workshops. Alongside the exhibition, the project will produce a high-quality photographic book which will feature all the images from the exhibition and stories about the farmers and their communities. Copies of this book will be available through the exhibition space and online. But we won’t stop there. After the exhibitions, the photos and the farmers’ stories will become a key campaigning tool, helping us reach out to policymakers and the public alike, and tell a more inspiring and affirming story of how we can continue to feed the world without trashing it and without the need for failed and damaging technologies like GMOs. The project is being led by Beyond GM, a campaign group with an impressive history of grassroots public engagement and high profile campaigns. Last year, for example, we launched The Letter from America, an open letter from American citizens to British citizens detailing the impact of 20 years of growing and eating GMOs. The Letter has been signed by individuals and groups representing 60 million Americans including high profile individuals such as Susan Sarandon, Daryl Hannah and Robert Kennedy Junior. It generated hundreds of letters to MPs in the UK and has now been translated into 8 languages. We Feed the world has had early support from amazing funders such as the A Team Foundation and the Roddick Foundation, as well as well-known sustainable brands such Riverford Organic Farms, Yeo Valley, Viridian Nutrition and Pukka Teas. But it’s sheer scope means we still have a way to go to see it fully funded. Please help us bring this project to life by donating what you can via the button below. Your donation can help take this amazing project to a global audience and start a bigger and more positive conversation about food, farming and our collective future.